Combined driver Chester Weber continued his winning streak at the prestigious Live Oak International Combined Driving event by driving away the winner of the Four-In-Hand FEI Horse Team. The world class qualifying competition draws top competitors to Ocala, Florida, each year, and is considered to be one of the premier combined driving events in North America. 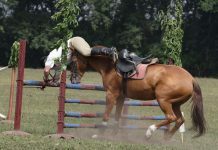 Weber, who has his sights set on qualifying for the 2010 World Equestrian Games in the Four-In-Hand division, won all three phases of the Live Oak competition: dressage, marathon and cones. “I am really pleased with this win because it is the biggest FEI show of the year,” Weber said. Weber’s team consisted of Reno W, Rolex W, Para, Senate and Boy W. Five year old Reno W, a new shining star on Team Weber, rose to the challenge of the difficult courses. Weber’s USEF Horse of the Year, Jamaica, took time off to give Reno W the chance to prove himself. 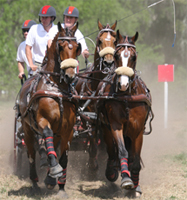 The Live Oak competition served as a selection trial for the USEF and for the 2009 FEI World Driving Championships. 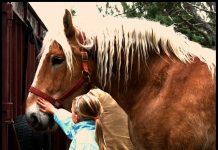 For the first time in 17 years, the competition was captured on tape and will be broadcast to equestrian enthusiasts at HorseTV.com. Weber experienced a banner year in 2008, as he and Jamaica finished the year with top honors from the USEF. Weber also became the first American to win an individual medal at the Four-In-Hand World Championships in The Netherlands. In addition, Weber started off 2009 on a winning note, capturing the Four-In-Hand title at the Sunshine State FEI Combined Driving Event in Ocala.